If you think summer is the season for amazing salads, think again! Fall is one of my favorite salad seasons! This Fall Flavor in a Flash! Salad has it all. Crunchy walnuts, juicy apples, chewy raisins, fresh baby spinach, caramelized red onion, spices, maple, cider vinegar and just loads of sassy-sweet flavor. Get ready to devour this because it tastes so darn good. Fall. Fall. Fall on me. Embrace me with your warmth. Coziness. Dependable flavors. Spices. Maple. Crunchy apples all day long. Warm and sticky sweet potatoes. Sweaters. Fluffy socks. Cider. Caramel apples. Hot cocoa. Warm chai. Pumpkin everything. Costume dreaming. Peanut butter. Muffins. Waffles. Steamy soups and stews. Sleek Vaute coats. Sturdy boots from MooShoes. Warm bread. Foamy lattes at brunch. Oatmeal. Cinnamon. Nutmeg. Vanilla bean. Orange zest. Pomegranate. Fall movies. Fall TV. Holidays-a-coming. Welcome gray sky workdays that feel somehow, kinda nice. Crisp air. Crunchy leaves. Brisk walks. What else??? Like so many, I love fall. And I have noticed over the years that these early fall-ish days are the times when moms, dads, students and pretty much everyone craves fast, easy, flavorful, nourishing recipes. And today I have a wonderful one for you! Other ingredients that I love for fall salads: Sweet potato, butternut squash, kale, beets, avocado, mushrooms, dried cranberries and more! Fall is a fresh and fantastic time to whip up some soothing, comfort food salads. PS. The dressing is so simple and GOOD. Cider adds tartness, maple sweetens things up, EVOO adds body and then I add some cinnamon, smoked paprika, salt and pepper to round things out. You could also add cayenne if you like a hint more heat. The trick to this dressing is to add ENOUGH to the salad. Like enough to coat everything, marinate the spinach and apple to really add some oomph with flavor. But not too much where you feel like your greens are drowning in it. If you accidentally add too much dressing, simply add a few more handfuls of greens to balance things out. If you want, you can make a double or triple dose of this dressing and store it in your fridge for ready-to-go flavor. The Cheese! Don’t forget the sprinkle of vegan Parm. It really adds a savory layer of flavor that warms everything up. If you do not have a store-bought Parm (there are at least three brands that I know of..) You can DIY it by blending walnuts and nutritional yeast until crumbly. Easy. Alright, happy fall everyone. Excuse me while I warm up Hocus Pocus on my TV, nibble pumpkin bread, sip a latte and flip through costume ideas on Pinterest. This super flavorful fall salad has it all! 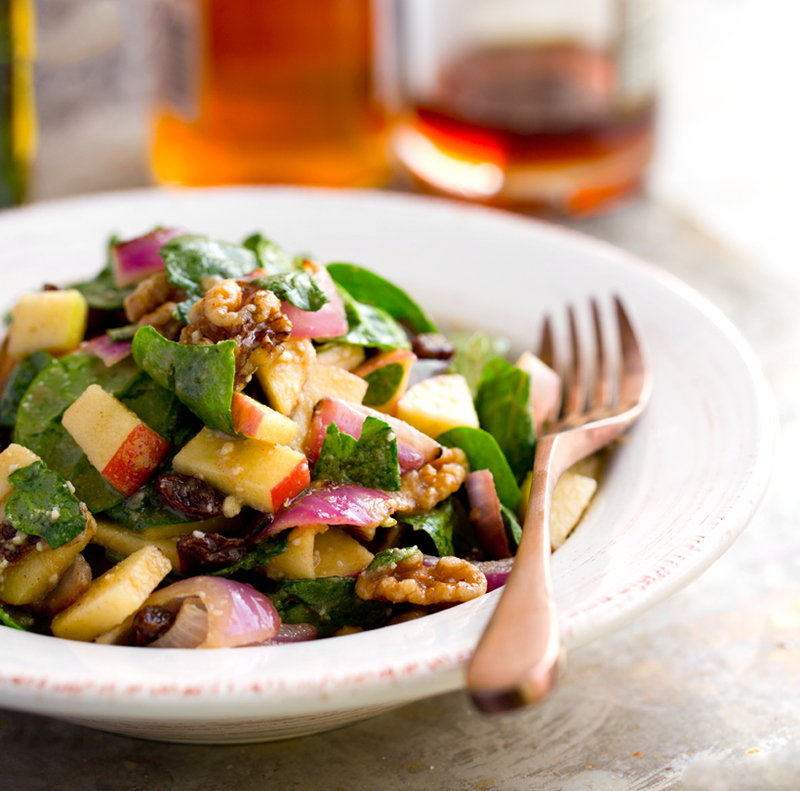 Crunchy walnuts, juicy apples, red onion, chewy raisins, fresh green spinach and the most flavorful fast fall dressing. Warm a skillet over high heat. Add a drizzle of olive oil. Add the onion. Saute for 2-3 minutes, until edges are soft, browned and caramelized. Scoot the onions to one side and add the walnuts. Allow to toast in the pan for a minute. Turn off heat. Set skillet aside. Add the dressing ingredients to a small cup and whisk until combined and silky smooth. Add the spinach to a large mixing bowl. Followed by the warm skillet onions, lightly toasted walnuts, apple, raisins, vegan cheese and dressing. Toss well until well combined and spinach becomes tender from the dressing and warm onions. Pour into serving bowls and serve while slightly warm.